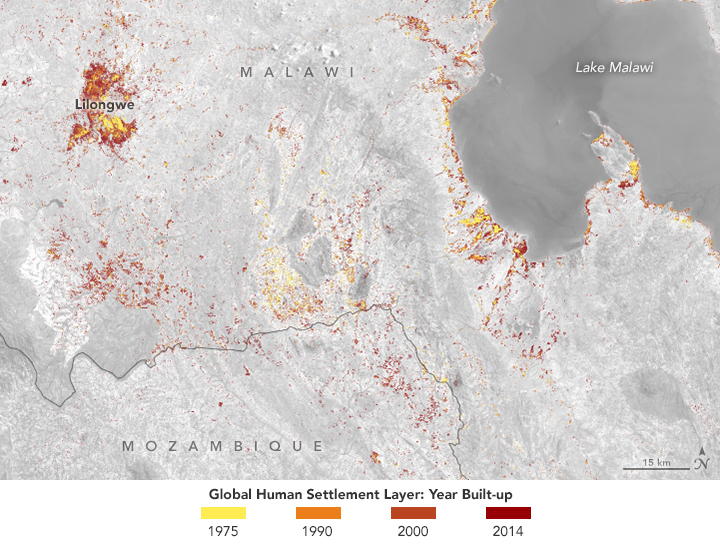 By coincidence, the Malawian capital of Lilongwe and America’s longest-running satellite program—Landsat—matured during the same period. 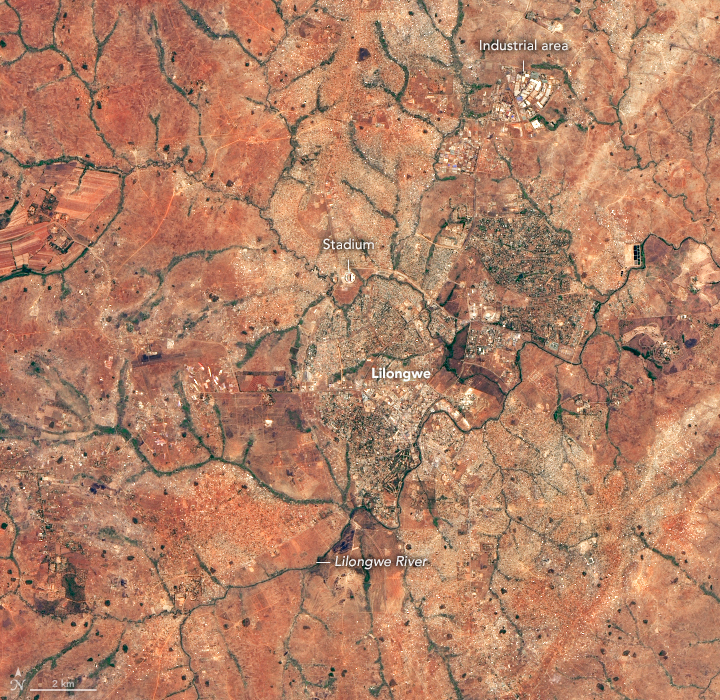 When the Landsat 1 satellite was being built in the late 1960s, Lilongwe was a modest fishing town on the banks of the Lilongwe River, with a population below 20,000 people. Around that time, Malawi’s longtime president, Hastings Banda, put the town on a different trajectory when he began the process of moving the nation’s capital there. As people and resources flowed into Lilongwe, a period of rapid urbanization began that continues today. By 2008, about 600,000 people lived in Lilongwe. By 2018, the population exceeded one million. The built area increased more than seven-fold, growing from 5 square kilometers (2 square miles) in 1990 to more than 35 square kilometers (14 square miles). Much of the growth has occurred northwest and south of Capital Hill, a centrally located part of the city with several government buildings. 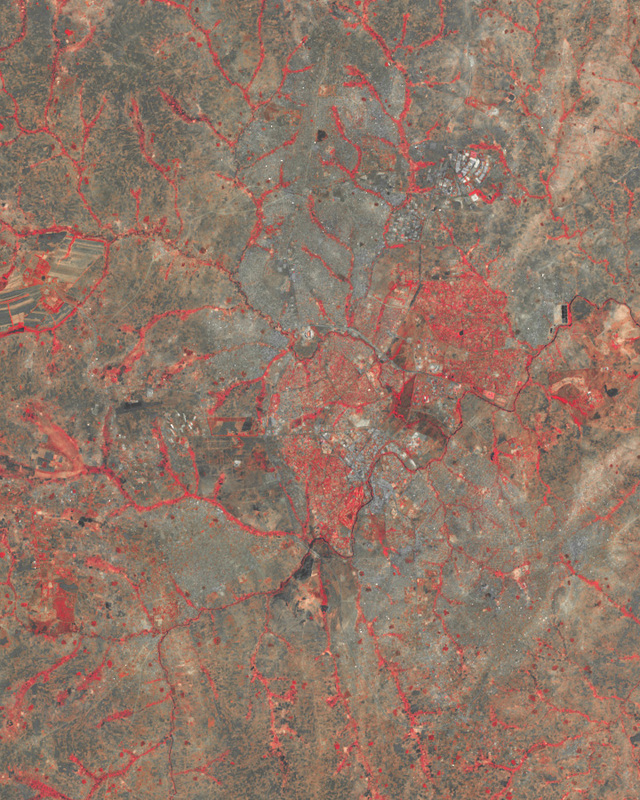 The Thematic Mapper (TM) on Landsat 5 captured the first image on August 27, 1984. 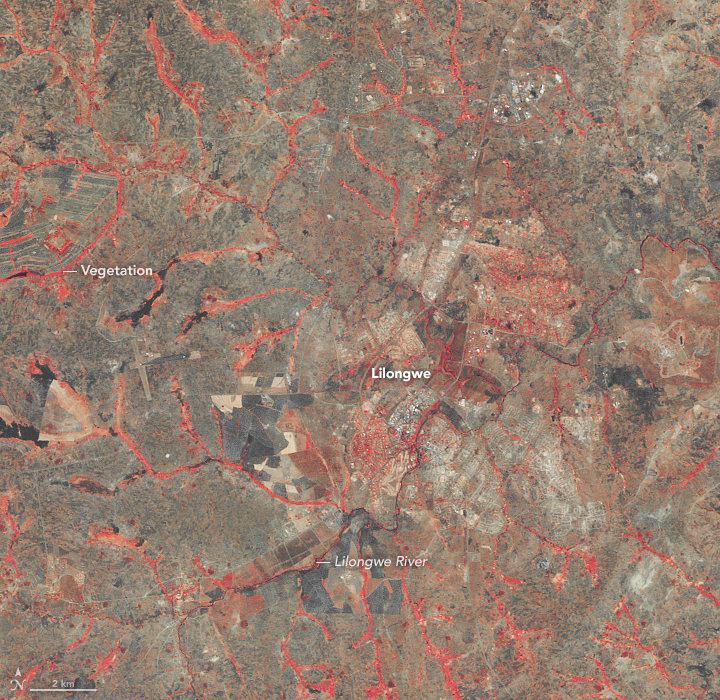 The second image, acquired by Landsat 8, shows the same area on September 26, 2018. The false-color images are based on a combination of near infrared, green and red light (bands 5-4-3). Healthy, living vegetation appears red; dried vegetation is brown. Urban areas are gray. The red linear features in the images above are trees and other vegetation living along stream banks. Leafy, wealthy neighborhoods appear red; more densely packed neighborhoods with fewer trees are mostly gray. 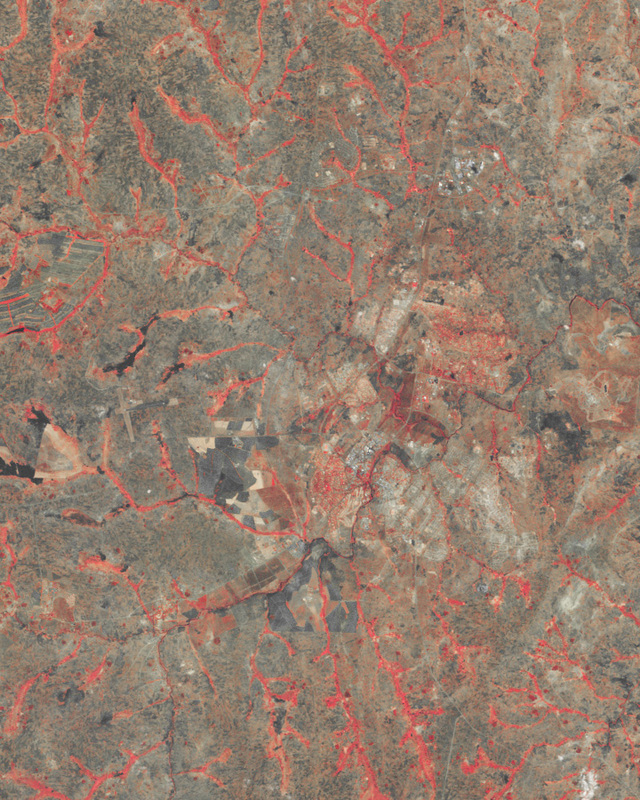 The natural-color image (above) was also acquired on September 26, 2018. A few of the most prominent additions include a Parliament building and convention center in Capital Hill, a new stadium, and major expansion of industrial zones in the northern part of the city. The fourth image (above)—a map based on data from the Global Human Settlement layer—shows the pace of development in Lilongwe and the broader region since 1975. While several towns along Lake Malawi have also expanded, the extent of growth is dwarfed by changes at Lilongwe. 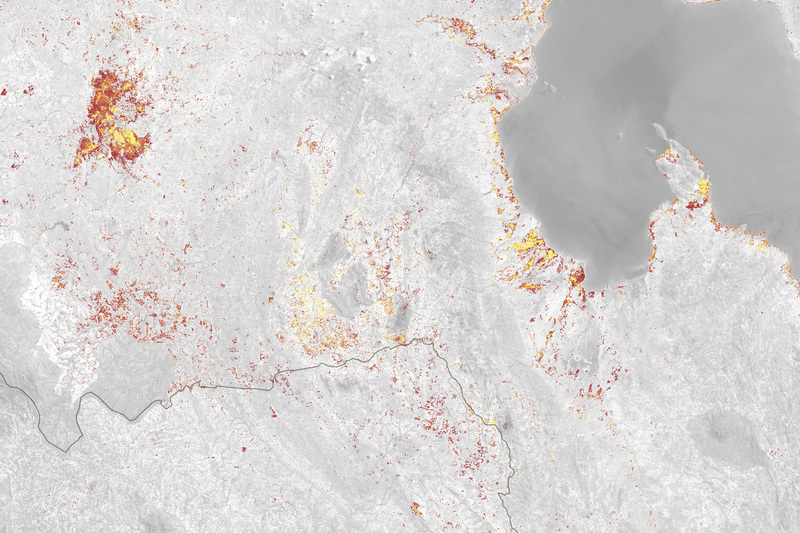 The Global Human Settlement data is derived from Landsat observations and generated by the European Commission and Joint Research Centre. 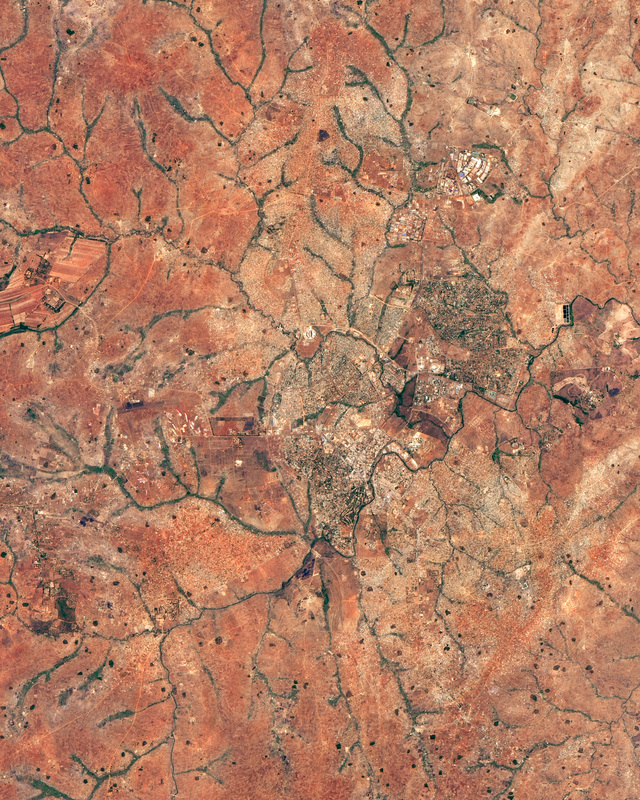 As Lilongwe grew and evolved, so did the Landsat program. By 2018, Landsat 8 was in its fifth year in orbit, Landsat 9 was targeting a launch date of 2020, and Landsat satellites had acquired tens of millions of scenes collectively. Encyclopedia Britannica Lilongwe. Accessed December 18, 2018. Manda, M. (2015) Malawi Situation of Urbanisation Report. Accessed December 18, 2018. Murayama, Y. et al. (2017) Urban Development in Asia and Africa. Accessed December 18, 2018. United Nations (2018) Malawi Lilongwe Urban Profile. Accessed December 18, 2018. U.S. Geological Survey (2018) Landsat Statistics. Accessed December 18, 2018. NASA Earth Observatory images by Lauren Dauphin, using Landsat data from the U.S. Geological Survey and GHS built-up grid, derived from Landsat (1975, 1990, 2000, 2014) from the European Commission and Joint Research Centre (JRC). Story by Adam Voiland.